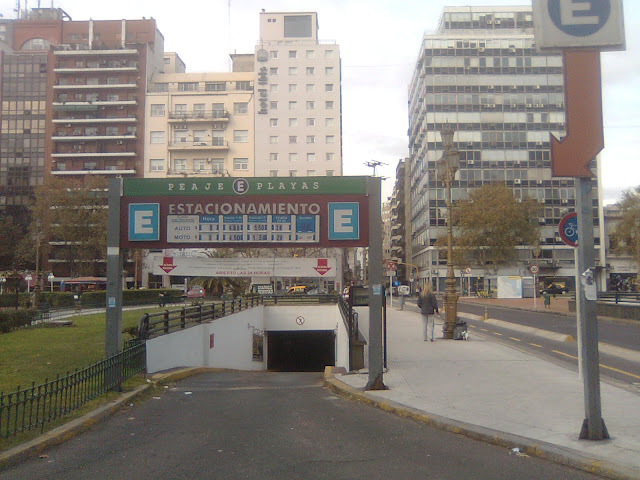 This post is about how to promote Walkable Parking. But, first, I had better talk about what it is, since the term is not (yet!) widely used. Planning for Walkable Parking basically means working to create more park-once-and-walk districts where much of the parking is open to the public, even if it is privately owned. It means enabling local ‘parking pools’ and not caring if any particular site has enough on-site parking. “Walkable Parking” is a way to make parking policy serve walkable urbanism, downtown revitalization, transit-oriented development and suburban retrofits. If you want a more multi-modal, less car-dependent, mobility system, Walkable Parking should be part of your strategy. Walkable Parking usually reduces the pressure to build too much parking (albeit indirectly). It also opens pathways towards parking success without parking excess, especially when combined with the rest of the Adaptive Parking agenda. That’s a big deal since so much conventional parking policy feeds traffic growth and car dependence. Conventional parking-minimums-based parking policy is harmful not only by promoting excessive parking but by promoting excessive ON-SITE parking. The result is that anyone arriving or departing by car typically does so directly to and from their destination building's parking lot. That is awful for walkability because most never engage on foot with the public realm nor the other businesses in the area. As the name suggests, walkability is intimately linked with the Walkable Parking agenda. Each helps the other. To learn more about Walkable Parking and why cities should promote it, read this 2016 post. [UPDATE: I have created a Local Parking Assessment kit focused on Walkable Parking. Below is a long list of possible steps. Consider urging your local government to make use of them and to adopt Walkable Parking as a goal. I decided to write this because it seems to fill a need. I have seen only scattered and rather skimpy guidance on park-once-and-walk planning. The key thrust of the Walkable Parking agenda is increasing the fraction of parking spaces that is open to the public. Some steps merely shift some of the parking closer to the open-to-the-public end of the spectrum and further from the completely-private-parking end. This is a preliminary list! Pushing towards public parking and park-once planning is a relatively undeveloped policy agenda. I may update and improve this from time to time. So feel free to suggest amendments or additions. First, here is a summary. Below that I give a little detail on each one. Opening parking to the public usually requires active parking management. However, there are cost and knowledge barriers to this which tend to deter the owners of small private parking areas. So one set of Walkable Parking steps involves local government efforts to reduce obstacles and costs that may deter private actors from opening their private parking to the public, or from taking smaller steps in that direction, such as entering parking sharing arrangements. Private-sector public parking should be included in parking guidance systems not just city-owned parking. These systems help parking-once-and-walk areas to work better by making it easier for motorists to find public parking and to know which facilities have spaces available. Local governments seeking a Walkable Parking approach can facilitate amalgamations of the private parking on several neighbouring sites (where layouts make this feasible), ideally also with improved parking management. 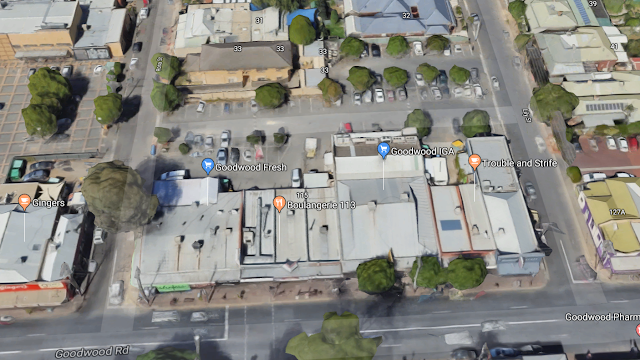 Local governments in Australia often assist multiple shops on old main street strips to create a common public or shared parking area behind them. Merged parking at the rear of shops along Goodwood Road, Goodwood, South Australia. Agreements to apply the city’s own parking management systems to previously private parking are another way to lower parking-management hurdles that may deter making private parking open to the public. This is reasonably common for enforcement. I have heard of examples from Australia, the UK and Canada. The private owner and the city agree for the municipal enforcement system to enforce the rules. Any revenue can go to the city or be shared. This arrangement is also helpful to reduce the problem that private-sector off-street parking enforcement can sometimes be predatory. The same idea can also be applied to parking fees (although I know of few examples so far). A private sector owner and the municipal parking fee system can work together to establish parking management goals for the fees and also share the revenue. Outreach and encouragement of shifts from private to public parking (or second-best steps in the right direction, such as parking sharing agreements). Advice on how best to manage public parking on private property and on how to engage reputable professional parking management service providers. Information on current and predicted parking patterns in the area and what to expect as parking is made public. This might include insight on supply and demand to allow wise supply and management decisions. Make owners aware of the possibility of joining the city’s parking management system (as in A3 above). Facilitate shared-parking arrangements (a matchmaker service). Some of Beijing’s District Governments have been active in this area for example. Facilitate parking amalgamations with collective parking management (as mentioned in A2 above). This section focuses on getting government out of the way of private initiatives that are helpful to Walkable Parking. Many cities have parking related regulations that would hinder the kinds of changes discussed in this post. An obvious example is parking minimums (see D1 and D2 below). Others may deter shared parking arrangements. In some cities, there are regulatory obstacles to the pricing of parking by private owners. 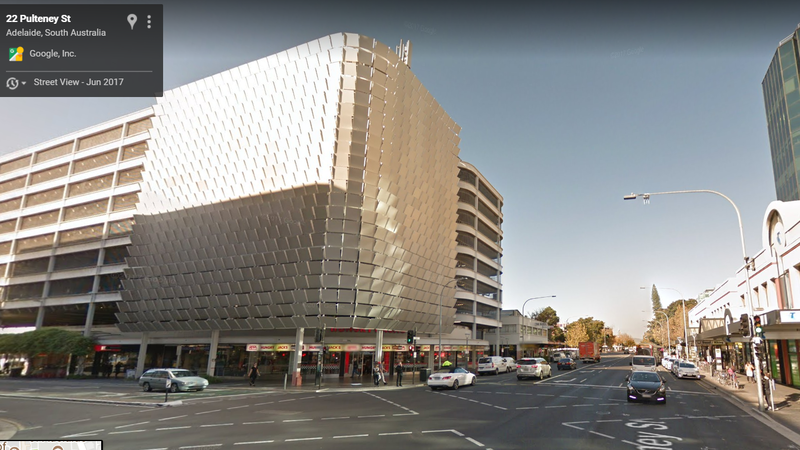 Any city wanting to pursue Walkable Parking may need to conduct an audit of its parking related regulations then work to remove such obstacles. A specific example worth mentioning is the new phenomenon of app-based businesses that allow owners of private parking spaces to rent them out (short-term or long-term). This effectively and relatively easily opens private parking to the public. Examples around the world include JustPark, ParkEx, SPOT, ParkHound, CurbFlip, ShareMyPark, Rakupa, ParkPNP, ParkShare and many more, including several in China. Governments should be liberal about these or even encourage them (while seeking appropriate tax payments). This phenomenon might be alarming in congested places that have been using parking maximums or parking supply caps as TDM measures. Municipalities may worry that allowing too much private parking to open to the public will undermine the TDM and increase traffic. However, public parking with a market price is still healthier for the area than private parking. It is highly consistent with Walkable Parking and the Adaptive Parking agenda, which encourages market responsiveness in parking (among other things). So, rather than banning such enterprises, it may be better to continue to restrain parking supply by other means. For example, the city could further tighten parking maximums and gradually reduce the supply of city-owned parking (either off-street and on-street) while reclaiming some of that space for better uses. Valet parking can help ease the pain of highly localized parking demand hot spots while making good use of public parking around the area. This business needs appropriate regulation but be as welcoming as possible. Valet parking can help Walkable Parking areas work better. This section highlights direct action to further Walkable Parking by local governments applied to their own assets, such as streets, city-owned parking facilities, and parking at city-owned institutions. In many localities, the on-street parking is the most obvious and easily-accessed public parking. It is the original park-once-and-walk parking. But it needs to be managed well. If public parking is scarce in an area, on-street parking will be very important, especially in the early stages of a Walkable Parking strategy. Cities often have good reason to remove certain on-street parking (for bicycle or bus-priority lanes for example). This point is not about promoting on-street parking per se. But be wary of removing on-street parking if it is the only open-to-the-public parking in the area. Walkable Parking requires some (well-managed) public parking in every locality. In managing residential permit districts, avoid completely excluding vehicles without permits, which would diminish the pool of public parking that Walkable Parking depends on. Instead allow public parking in parking permit zones and ration such public parking with strong enough parking management. It is reasonable for residents to expect well-managed streets with public parking rationed effectively but they should not expect exclusive use of the parking. You didn’t know that improving walkability was a parking policy did you? But walkability feeds the park-once ideal. If people are going to happily park and then walk to destinations, then walking needs to be comfortable and safe. So local government efforts to improve the environment for walking are a key part of walkable parking. This is a big topic of course. Make on-site parking at City Hall, other local government offices, and other city-owned facilities (such as swimming pools, libraries, parks and so on) open to the general public to the extent possible. This will usually require improved management, such as parking fees, if demand is high enough. Ideally, this should apply also to employee parking (with daily fees not monthly), which can be made more acceptable via parking cash-out or commuting allowance programs. City-owned public parking is often part of park-once strategies. Having at least some public parking in every vicinity is essential for Walkable Parking. Some cities overdo this. Waiving on-site parking requirements (for a fee) and building abundant public parking instead was famously part of the downtown revitalization strategy in Downtown Santa Monica in the Los Angeles region. But Walkable Parking is nevertheless an essential step towards parking success WITHOUT PARKING EXCESS. It helps open the way to many complementary parking reform steps that are otherwise very difficult if the city is trying to force parking into every development. Some cities lease or purchase existing parking lots from willing sellers and add them to the public supply (pdf). This is about turning private parking lots (which may not be open to public) into public lots that are open to the public. But let me say again, please don't overdo it. Be cautious about sinking city funds into parking facilities. Certainly don't invest if you have not yet established strong on-street parking management. Oversupplied parking is an extremely poor investment. And remember that public parking is much more efficiently used than private parking so,many cities find they do not need as much public parking as they thought they would. The process of opening some private parking to the public often eases local shortages (real or perceived). The suggestions in this section focus on local-government planning powers and tools, such as zoning and building codes, to encourage public parking and park-once outcomes. Minimum parking requirements (=parking minimums) undermine Walkable Parking by encouraging plentiful on-site parking with every building. The "on-site" part of this is just as important as the "plentiful" part in reducing the chances that off-street parking will be opened to the public and managed. Paradoxically, having a little parking scarcity tends to promote opening of parking to the public, since it prompts parking owners to manage their parking more actively (often with pricing), which allows them to deal with outsider parking and to profit from doing so. Consider that much of the parking in many downtowns is open to the public while most parking in car-oriented suburban strips is private. 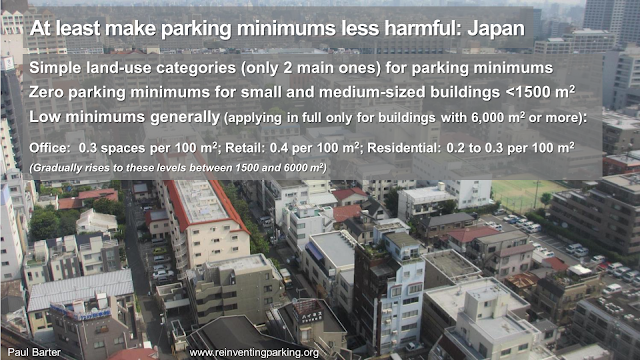 Abolishing parking minimums is an increasingly common step around the world. Mexico City is the most dramatic recent case but there are many others. At the very least, do so in any area where Walkable Parking (park-once-and-walk planning) is the strategy. 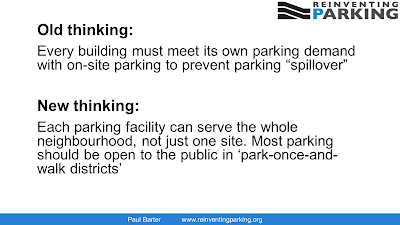 More fundamentally, parking minimums are based on a parking mindset that assumes that parking should take place in the on-site parking of each destination and that public parking (especially in the streets) is a problem called spillover parking. This mindset runs completely counter to Walkable Parking, which is based on planning for parking to happen anywhere within a park-once-and-walk area. If your city is not yet ready to abolish parking minimums it is still possible to reduce their harm and make them more compatible with Walkable Parking. A key goal is to reduce their rigidity and increase the chances that parking is off-site and potentially shared or open to the public. Prevent parking in the frontage areas of buildings or between buildings and sidewalks. Even for sites that are devoted to parking, try to have them lined with active land-uses such as retail, avoiding having parking or dead walls by the sidewalk. Encourage pedestrian links in and out of public parking to link with the broad public realm (rather than channeling them only through private buildings). In streets where parking is allowed, ban new curb cuts (= kerb cuts = driveways) to private off-street parking with only a few spaces since these needlessly create conflict with people on foot for little or no net gain in parking spaces. As mentioned in item C3, good walkability is essential for Walkable Parking to work well. That suggestion was about improving the public realm for walking. This one is about urban planning and zoning for walkability. The planning literature has much to say on this. 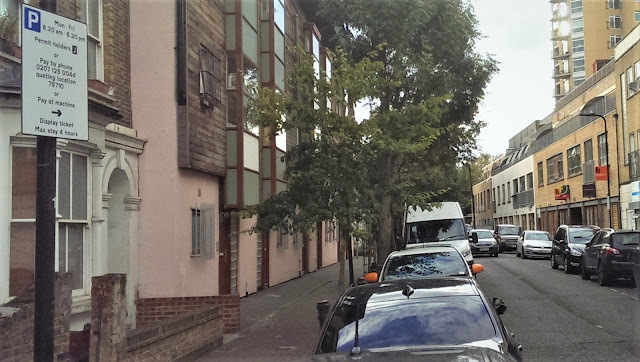 Advice includes encouraging narrow building frontages, having buildings “address the street” (avoiding large set-backs), maintaining permeability for pedestrians (including through large developments), preferring small and medium sized development sites rather than enormous ones, and many others. A fine-grain mix of land-uses is part of planning for walkability. But it deserves its own item because of its special implications for parking. Having different land uses in close proximity enables efficient use of public parking (or shared parking) by having complementary peak demand periods. So planning reforms to better enable land-use mixing will help with Walkable Parking. Examples include steps to legalize corner shops, ground floor retail, mixed use complexes, and many others. Emulate the Japanese approach to zoning, which is liberal towards many kinds of land-use mixing. Municipalities in many countries use a range of planning bonuses (such as density bonuses) to encourage developers to provide various amenities. These tools can also be used to encourage on-site parking to be designed to be open to the public and not private. This is best done at the design stage so that public parking is compatible with building security arrangements, among other issues. Public priced parking in a private mixed-use building. Pereira, Colombia. This may be too rigid an approach but may be relevant to some cities. The need for exemptions for certain buildings would arise with more force than if incentives are used. Large integrated developments, which often see detailed design and planning from the local government, present an opportunity to directly plan for Walkable Parking. The issues above are relevant of course. In addition, such master-planned developments can be planned with common public parking to serve a whole area with many buildings (and located peripherally or underground). This parking should be intensively managed to take full advantage of the benefits of shared and public parking while still serving the needs of residents, tenants, employees, businesses, customers and visitors. Examples with some of these characteristics include the peripheral parking of the Vauban area of Freiburg, Germany and the common parking in several recently developed districts in Singapore, such as Biopolis. Large facilities such as stadiums, hospitals, education campuses, large places of worship, large stores, etc. are often built with enormous amounts of dedicated parking that is the antithesis of Walkable Parking. To be compatible with Walkable Parking, we should instead site such things in walkable locations and design them to be part of walkable districts (with multi-modal access options), rather than isolated car-oriented locations. We should also plan for their parking to be part of the local Walkable Parking (park-once-and-walk) area. They would then be able to make use of existing public parking and to avoid too much new supply. Conversely, any new on-site parking built with the facility should also be open to the public to become part of that same local pool of parking in the park-once-and-walk district. 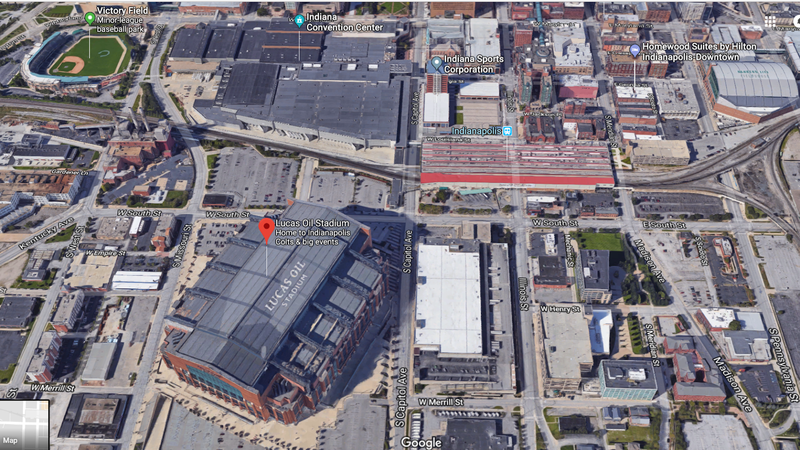 Lucas Oil Stadium and its relatively walkable urban context. Indianapolis, Indiana, USA. Various Walkable Parking characteristics can also be fostered with financial incentives or disincentives to private actors, especially owners and managers of parking. Planning based incentives were mentioned in D6 above. Here we are talking about money changing hand. A possible example might be a property tax rebate for every off-street parking space opened to the public (and a smaller property tax incentives for parking to be shared). There would need to be occasional monitoring to ensure the parking really is open to the public. The opposite approach is to penalize private parking with some kind of levy. Spaces open to the public would be exempt and spaces in qualifying sharing agreements could be partially exempt. Such a levy would need to be high enough to give an incentive for parking owners to open their parking to the public but not so high that it makes opening to the public effectively compulsory. The idea is to offer a nudge but to allow ongoing private parking on sites where public parking is not wanted or feasible. Such a levy might be used to fund the rebate mentioned in E1 or other efforts with significant costs, such as those in A4 or C3 above. I mentioned above that Walkable Parking is a key part of seeking parking success without parkig excess. It does this best as part of the wider agenda, Adaptive Parking, which regular readers may remember. This post has been all about the “S” in the Adaptive Parking memory aid, RESPOnD. It stands for “share” and includes the agenda of making more parking completely open to the public. If you found this article useful, please subscribe and never miss a future post. Use the box at the top of the page. This post by Paul Barter appeared first on Reinventing Parking. Very practical and informative for the owners/managers of both new and existing parking facilities to consider. This idea is trending. Thank you Paul! A question: In D3, you mention discouraging first floor parking. A number of facility designers are actually doing more of this recently, visioning the first floor as a way to expand the development's curb space for ride hailing, car sharing, etc., with the idea of removing this traffic from the streetside parking areas These areas are free-flow, short-term, "micro-parking", ungated but monitored for abuse. Could you elaborate on what you see as the downsides of first floor parking? Thanks for the question! The point about discouraging ground level on-site parking in D3 is mainly about having active frontages along the side-walk as part of walkability-promoting design guidelines. The trend you mention towards including drop-off space within buildings at ground level is interesting. [By the way, this has actually long been a feature of most large buildings in Singapore (and most new buildings are large here), encouraged by the urban planners.] But doing this does create lots of vehicle/pedestrian conflict as driveways cut across sidewalks. Sometimes this might be the best design option I guess, and there are certain advantages as you mention, but generally I think it would be more in line with walkability to accommodate drop-offs/pick-ups on the street, not off-street. Thanks for sharing this detailed information about Walkable Parking ..Very Interesting Article. It was very helpful and informative. Enjoyed reading it. Do keep posting such informative blogs...! !